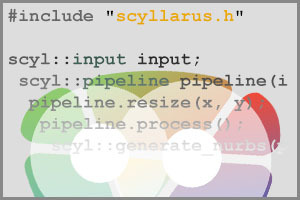 The Scyllarus C++ API is aimed at developers who want to integrate Hyperspectral Processing into their application, or would like to build an application that makes use of the features of Scyllarus. Scyven, the ‘Scyllarus Visualisation Environment’ is built upon the Scyllarus C++ API, if you want to see the features of the API in action, you can check it out now. The Scyllarus C++ API includes many powerful image processing features and tools targeted at Hyperspectral Imaging applications. With an easy to use modular design, it’s simple to integrate the Scyllarus API into your project. HSZ (Hyperspectral Zip) Find out more.. Accelerated by Armadillo, BLAS, LAPACK, OpenCV, OpenMP and Boost. Ongoing development – addition of features, performance and memory enhancements, bug-fixes (changelog). The Scyllarus C++ API image processing model closely mirrors the logical workflow process used for analysing Hyperspectral data. You can see how the processing pipeline implemented by the Scyllarus API relates closely to the workflow described here. Please Contact Us to find out more about getting the Scyllarus C++ API.